Did China's State-Run News Wire Purchase Twitter Followers? Home » Personal Blog » Blog Articles » Did China’s State-Run News Agency Purchase Twitter Followers? A socialbakers.com graph charts the number of users Xinhua follows itself. According to a similar tool at socialbakers.com, the number of Twitter accounts Xinhua itself was following dropped sharply from around 450 on March 15th to 81 a day later. It is likely the fraudulent accounts were also deleted in a clear-out by Twitter. One user attempted to keep track of Xinhua’s suspicious account activity last year. Under the Twitter handle @6Jing, Fake Followers Watch suggested that Xinhua “purchased” 25,000 followers on May 9th last year. Over the space of a few days, it charted unusual and sudden increases in Xinhua followers – sometimes in the hundreds of thousands. 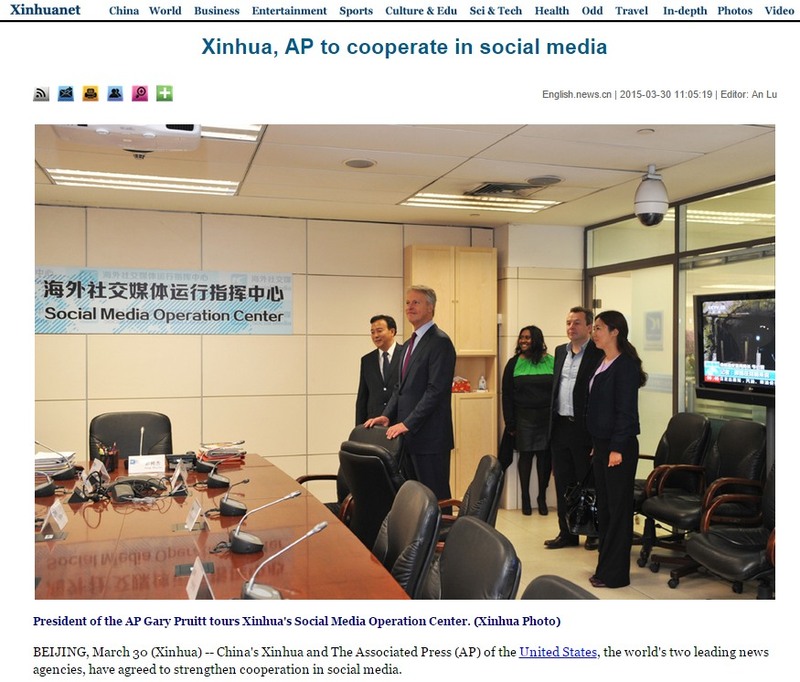 In a story published on March 30th, Xinhua claimed to have struck a social media partnership with the Associated Press. However, on April 3rd, the AP’s media relations director Paul Colford said that “there is no social media sharing arrangement planned between AP and Xinhua,” according to the Sydney Morning Herald. A Xinhua story, dated March 30th, which remains disputed by the AP. At the time of writing, Chinese state-backed news outlets Global Times and People’s Daily had around 28,000 followers and 93,000 Twitter followers respectively. With a fan base of 1.5 million, Xinhua’s three year old account is the most popular news-related Twitter feed in China – BBC Chinese is placed second with 237,707 followers. Xinhua appears to be more popular than the UK-based Independent and ten times more popular than the Hong Kong-based South China Morning Post. The presence of the Communist Party’s official press agency on Twitter caused uproar in 2012 with Chinese netizens questioning why they were banned from using the American social network while Beijing-based Xinhua had access. Twitter.com remains blocked by China’s “Great Fire Wall” and is only accessible through private network and proxy services. Twitter and Xinhua did not respond to enquiries.